The third observing run for Advanced LIGO – O3 – started on April 1 2019, after 19 months upgrading the detectors. 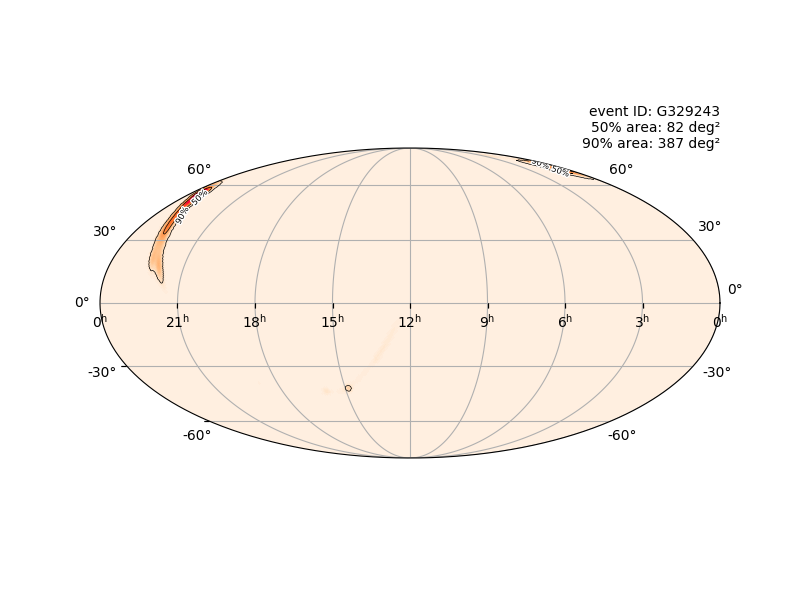 Last night, April 8, saw the first new detection of a candidate gravitational wave source, apparently another black hole binary, dubbed S190408an. It is anticipated that sources like this will be discovered at a rate of roughly one per week for the (planned) year-long run. Given the likely rate of events the policy of LIGO is now to make data publicly available directly without writing papers first. You can find the data entry for this event here, including this map of its position. Whether the LIGO Scientific Collaboration will release sufficient data for others to perform a full analysis of the signal remains to be seen, but if the predicted detection rate matches reality, the field is going to move very rapidly from studies of individual events to statistical analysis of large populations. Such is the way of science! Following yesterday’s post here is a nice video visualization of all the black hole binary mergers so far claimed to have been detected by Advanced LIGO. They’re computer simulations, of course, not actual black holes (which you wouldn’t be able to see). I always thought an Orrery was a clockwork device, rather than a digital computer, but there you go. Poetic license! I can’t say I’m very keen on the music. I think it’s very sneaky of the LIGO Scientific Collaboration and the Virgo Collaboration to have released two new gravitational wave papers while I was out of circulation fora couple of days, so I’m a bit late on this, but here are links to the new results on the arXiv. You can click on all the excerpts below to make them bigger. and probability > 0.5 of being of astrophysical origin (see Eq. (10) for the definition) are henceforth denoted with the GW prefix. The use of false discovery rates is discussed at length here as a corrective to relying on p-values for detections. The criteria adopted here don’t seem all that strong to me. I’ve been teaching and/or preparing lectures all day today, so I haven’t yet had time to read these papers in detail. I will try to read them over the next few days. In the meantime I would welcome comments through the box about these new results. I wonder if there’ll be any opinions from the direction of Copenhagen? I think it’s safe to say that if GW151266 had been the first to be announced, the news would have been greeted with considerable skepticism! Following my recent post about the claims and counter-claims concerning the detection (or otherwise) of gravitational waves, I have a couple of updates. We use the Pearson cross-correlation statistic proposed by Liu & Jackson (2016), and employed by Creswell et al. (2017), to look for statistically significant correlations between the LIGO Hanford and Livingston detectors at the time of the binary black hole merger GW150914. We compute this statistic for the calibrated strain data released by LIGO, using both the residuals provided by LIGO and using our own subtraction of a maximum-likelihood waveform that is constructed to model binary black hole mergers in general relativity. To assign a significance to the values obtained, we calculate the cross-correlation of both simulated Gaussian noise and data from the LIGO detectors at times during which no detection of gravitational waves has been claimed. We find that after subtracting the maximum likelihood waveform there are no statistically significant correlations between the residuals of the two detectors at the time of GW150914. Meanwhile, the NBI group behind the Cresswell et al. paper challenged by the above paper has issued a statement which you can read here. The group re-iterate points made in the New Scientist article discussed in my recent post. Although the Nielsen et al. paper is not explicitly mentioned in the NBI statement but I’m given to understand that the Danish group does not agree with the conclusions in that paper. Interesting post from a gravitational wave researcher, telling the inside story of the latest gravitational wave detection (a binary black hole merger) announced last week. And then there were five…. …black hole mergers detected via gravitational waves, that is. Here are the key measurements for Number 5, codename GW170608. More information can be found here. 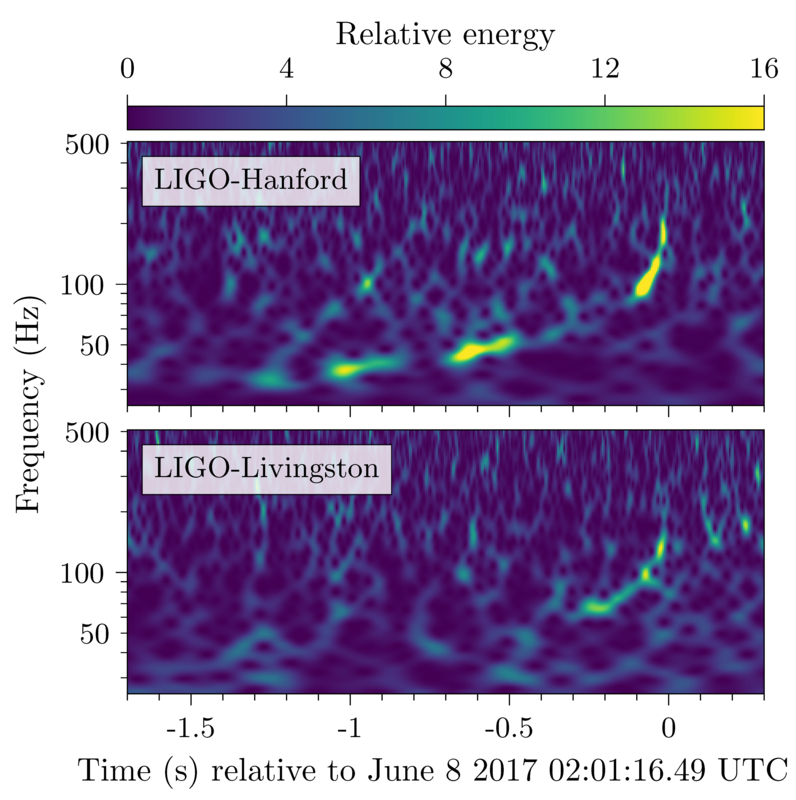 On June 8, 2017 at 02:01:16.49 UTC, a gravitational-wave signal from the merger of two stellar-mass black holes was observed by the two Advanced LIGO detectors with a network signal-to-noise ratio of 13. 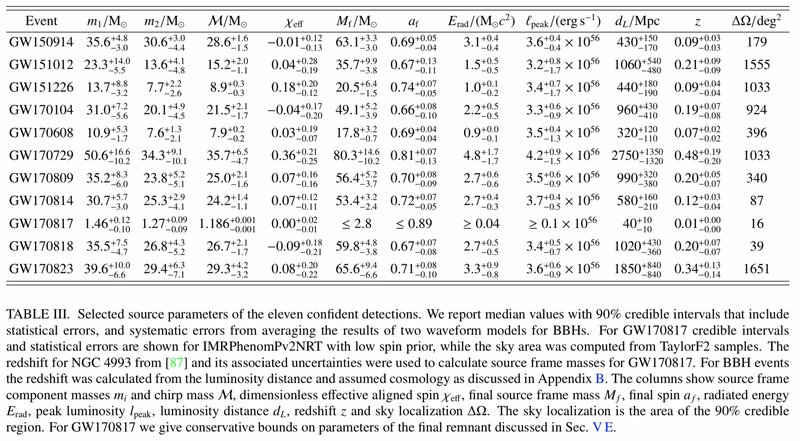 This system is the lightest black hole binary so far observed, with component masses 12+7-2 M⊙ and 7+2-2 M⊙ (90% credible intervals). These lie in the range of measured black hole masses in low-mass X-ray binaries, thus allowing us to compare black holes detected through gravitational waves with electromagnetic observations. The source’s luminosity distance is 340 +140-140Mpc, corresponding to redshift 0.07+0.03-0.03. 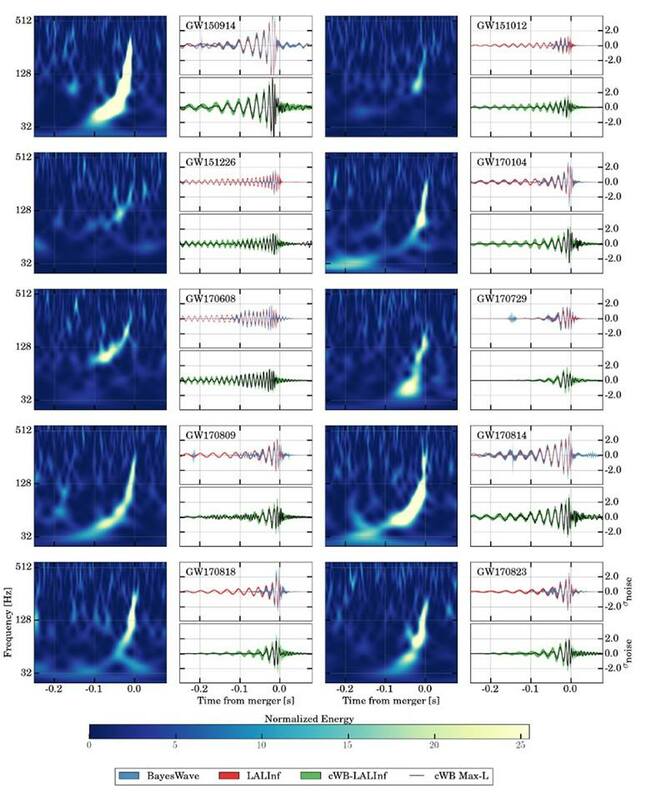 We verify that the signal waveform is consistent with the predictions of general relativity.